These delicious Italian baked lumaconi pasta shells with Catalonian chicory and porcini mushrooms are perfect for meatless Mondays, vegetarians and baked pasta fans! You can even serve them as finger food! Like other baked pasta recipes, stuffed or filled baked pasta shells are a popular menu item on Italian tables on Sundays and holidays. 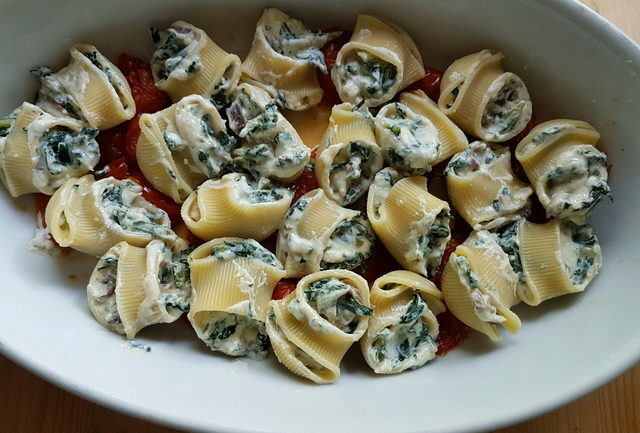 These dishes are most often made with giant pasta shells Italians call conchiglioni. However, as an alternative to baked conchiglioni, I really like baked lumaconi pasta shells. Lumaconi means giant snail in Italian and that’s exactly what these pasta shells look like! There’s very little difference between lumaconi and conchiglioni. They taste the same and can be used in the same recipes. Lumaconi are a little more fiddly to fill because they have a strip of pasta over the cavity, which I think also makes them look like little baskets! 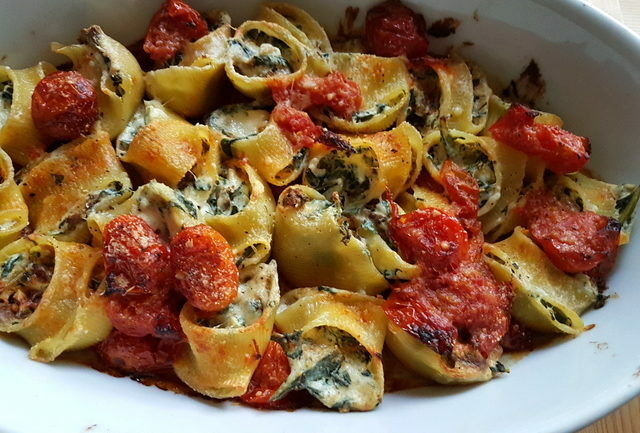 Although baked pasta shells can be made with a meat filling or sauce, they are actually most often filled with a combination of soft cheese and vegetables and then baked in a tomato or béchamel sauce. 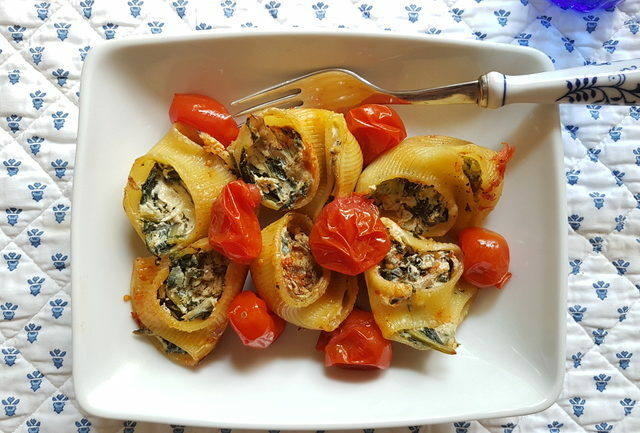 The most classic of these fillings is spinach and ricotta, but many other filling combinations exist. In this baked lumaconi pasta shells recipe, the pasta is filled with a delicious combination of ricotta, Catalonian chicory and porcini mushrooms! 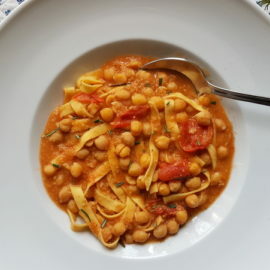 Italians often refer to these meatless recipes as ‘di magro’ meaning lean. Today we talk about meatless Mondays but, historically, the day when people in Italy didn’t eat meat was Friday (and even Wednesday too at one point). Not eating meat on certain days is a religious tradition, rather than a dietary one. This meatless Friday tradition continues to be followed in some Italian families. In fact, although more lenient than in the past, it is still a ‘rule’ of the Catholic church, as is not eating meat on religious days of fasting and abstinence such as during Lent. Back in the Middle Ages, there was a time in Italy and the rest of Catholic Europe when not fasting during Lent was even punishable by death! And for a long time other animal derivatives including dairy products and eggs were abstained from too. Fish was and is allowed during days of abstinence, so Lenten or ‘di magro’ recipes often include fish as well. 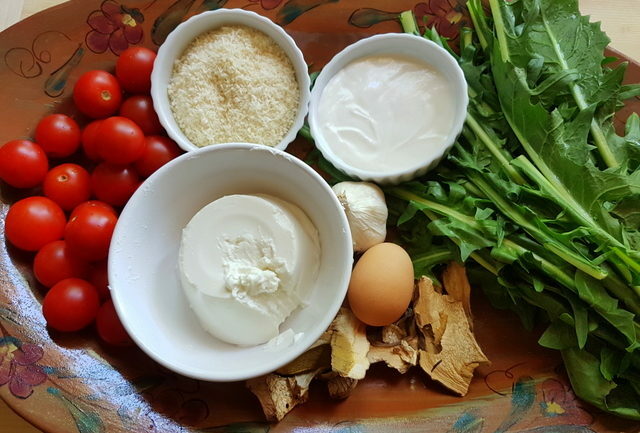 Despite living in a more secular world, many ‘di magro’ recipes remain traditional dishes on religious holidays in Italy. 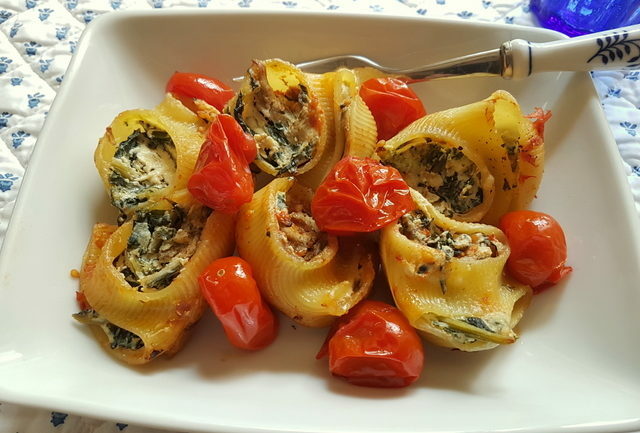 Although recipes like this baked lumaconi pasta shells are the most popuar, there are other traditional ‘di magro’ ways of serving pasta. In Emilia-Romagna, they have Lenten cappelletti which are filled with ricotta and Parmesan. Here in Veneto, bigoli with an anchovy sauce is a typical dish on days of abstinence. And there are even some ‘sweet’ pasta recipes, like ravioli filled with chestnuts and jam in Faenza. Ricotta is pretty standard as a filling for baked pasta shells here. 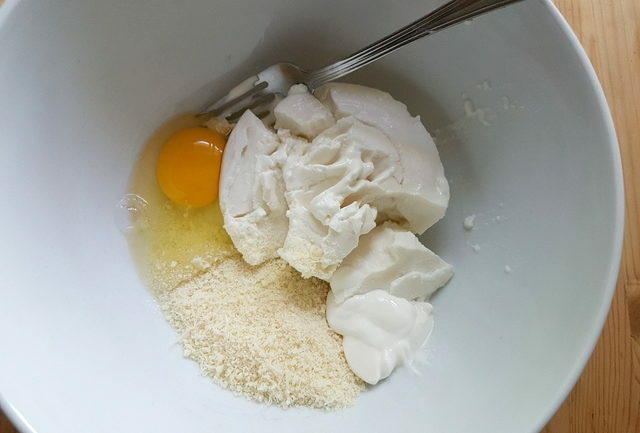 Italians use both cow and sheep ricotta as a filling base. 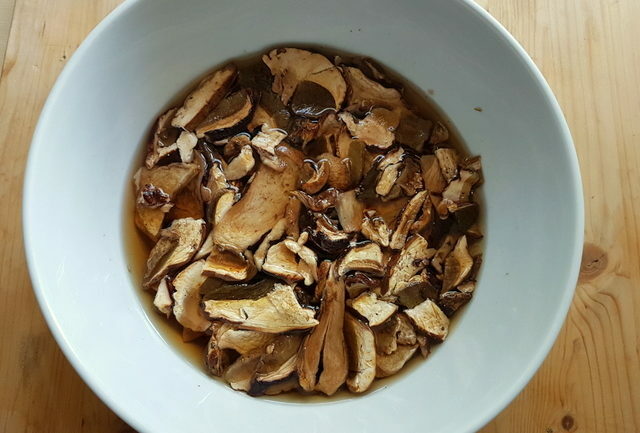 Porcini are a more unusual ingredient for this type of pasta filling. 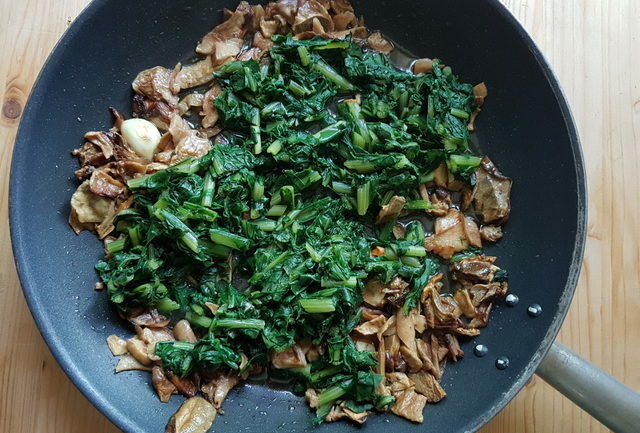 But, I think the mushrooms gave this filling a wonderful earthy taste and including Catalonian chicory instead of the usual spinach also added more flavour. Catalonian chicory (also called Italian dandelion greens) is a member of the same leaf vegetable family as endive, escarole and the different varieties of radicchio that are especially popular in Northern Italy. Many of these chicories have been cultivated here in the Veneto region since the 15th century! Italians love these veggies, despite their slightly bitter taste. They eat them raw and cooked, as side dishes or in salads, soups and risotto. They are also used a lot in pasta recipes. If you can’t find this type of chicory you can, of course, use spinach. Meatless baked pasta recipes are a perfect addition to any family meal plan. Obviously, they are great for vegetarians and on meatless Mondays (or Fridays). They are also certainly lighter and healthier than versions with meat. Like all baked pasta recipes, this one takes a little time to make but it’s definitely worth the effort! You can prepare it on Sunday and eat it on Monday! In fact, you can prepare this baked lumaconi pasta shells recipe in advance and then bake just before eating. The pasta shells really hold their shape well so you can even serve them as finger food. 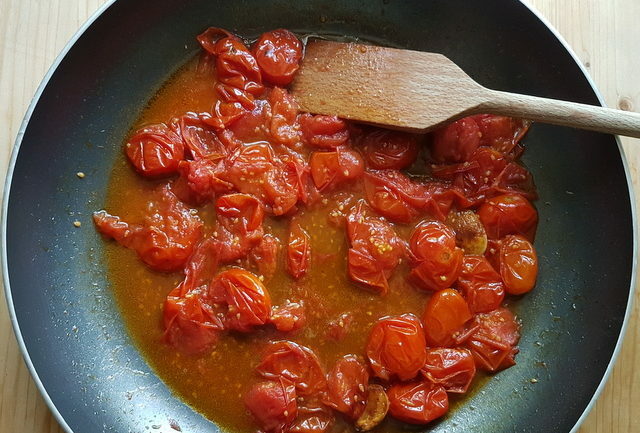 Use béchamel sauce instead of a tomato sauce to change things up a bit. 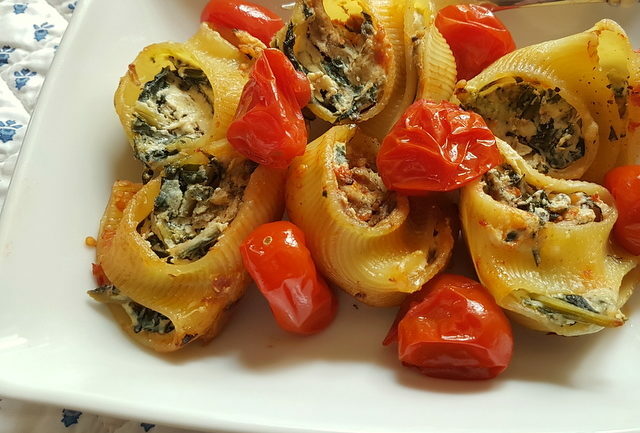 However, whichever sauce you decide to cook these baked lumaconi pasta shells with, I’m sure you’re going to love this recipe. What a great recipe idea! 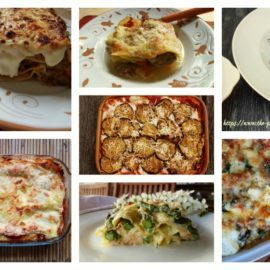 I love the thought of all of these wonderful flavors stuffed into pasta shells. Can’t wait to give this a try! Such a great idea to use this as an appetizer too! With party season quickly coming, you can never have too many finger food ideas to add to the affair, thanks! This pasta dish sounds delicious! I love chicory, but never thought to put it in pasta before. I can’t wait to make this for my vegetarian friends! I’ve never seen shells like this, but now I have to find them! These look amazing! This is bursting with wonderful flavors. I really love shells and the combination of flavors are perfect! Oh, this dish looks absolutely amazing. I’ve never had lumaconi pasta before, but this recipe sounds delicious. I love all of the seasonings and spices that you used. I don’t think I’ve ever seen this kind of pasta before, it looks fun! Tasty looking filling too… love the spinach in there! Stuffed pasta is the absolute best, and your version looks divine. 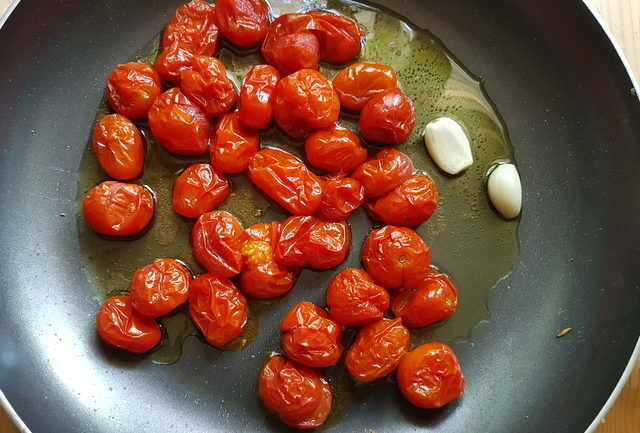 I love the way you used those cherry tomatoes.